Consider, for example, a man whose mother is Asian and whose father is white. This may seem like someone who could easily be categorized as multiracial. But if this man was raised with little or no interaction with his white relatives or had experiences that were more closely aligned with those of the Asian community, he may well select “Asian” and nothing else when describing his race. Furthermore, some adults may have relatives of different races farther back in their family tree. While some people may think to include a more distant relative of a different race when asked about their racial background, others may not, even if they are aware of their family history. 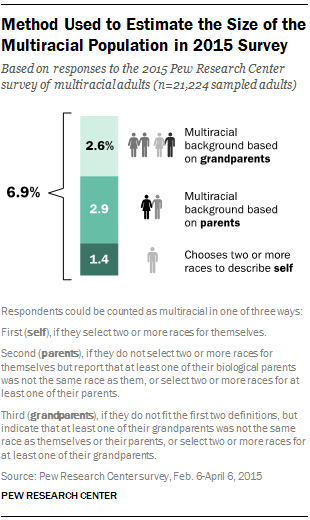 With this in mind, we set out to test six different ways of defining a population of mixed-race adults to survey, using as our primary vehicle Pew Research Center’s American Trends Panel (ATP), a probability-based, nationally representative online panel of adults in the United States. We tested these different approaches with impaneled individuals who participated in more than one Pew Research Center survey, allowing us to examine how the same individual might have changed his or her responses depending on the question asked. In this report, we share the results of these six survey experiments with a focus on the ways in which the different wordings of the stem, different response options and different modes used impacted the projected size of the U.S. multiracial population. We also look at the consistency in selecting two or more races across different measures at the individual level, as well as how estimates of specific subgroups of multiracial adults—most notably white and American Indian biracial adults—vary by question type. Census Alternative Questionnaire Experiment measure. We then tested a question being considered for the 2020 decennial census, in which the Hispanic origin response option is included with the racial categories in a “mark one or more” format. Using this measure, called the Alternative Questionnaire Experiment (AQE), we found that 4.8% of adults reported two or more races (not including Hispanic or some other race). 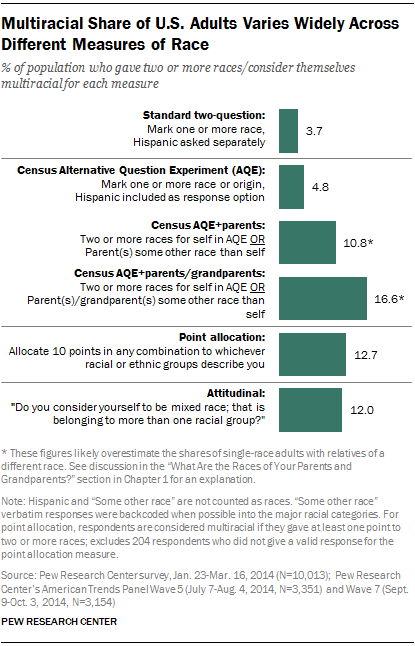 Census AQE measure with parents’ races. Some researchers have argued that the population with a mixed racial background is likely broader than the share of adults who report two or more races when asked to identify their own race in a “mark one or more” format. One of the ways we tested this theory was by exploring the race and ethnicity of respondents’ parents and grandparents. First, we asked those who chose only one race in the AQE measure whether either their mother or father was “some other race or origin” than the race they selected for themselves. This roughly doubled the share reporting a multiracial background to 10.8%. Census AQE measure with parents’ and grandparents’ races. For those who said they did not have a parent of a different race, we asked whether any of their grandparents were “some other race or origin” than their own, which increased the share indicating a multiracial background to 16.6%. As discussed below, because of the way the follow-up questions were worded, we believe the share of single-race adults indicating that they have a parent or grandparent of a different race overestimates the multiracial population. Point allocation measure. Next, we tested an experimental measure developed by University of California, Berkeley political scientist Taeku Lee in which respondents are given 10 “identity points” and asked to allocate them across different racial and ethnic categories however they see fit. For example, if they think of themselves as half white and half black, they could allocate five points to each, but if they think of themselves as mostly white, but had a black ancestor, they could allocate nine points to white and one point to black. This measure was developed to increase the share of adults reporting two or more races, and the Pew Research Center analysis finds that it does compared with the “mark one or more” approaches—some 12.7% of adults gave points to two or more races using this measure. Attitudinal measure. Finally, we asked people directly, “Do you consider yourself to be mixed race; that is, belonging to more than one racial group?” Taking this approach, 12.0% of adults identified themselves as multiracial. The remainder of this report will discuss in detail the various methods Pew Research Center tested to measure respondents’ racial backgrounds, including exact question wording, as well as an assessment of the resulting racial composition and of the challenges or concerns that each question elicits. Furthermore, because these questions were asked of the same individuals in different interviews, we are also able to examine whether the same individual changed his or her responses depending on the type of question asked. This report will look at the consistency in selecting two or more races at the individual level across the different methods, including among various multiracial subgroups. A more detailed breakdown of the racial composition of the adult population captured by the different measures, as well as a comparison of other demographics of the multiracial population captured by each measure, can be found in the tables in Appendix A.